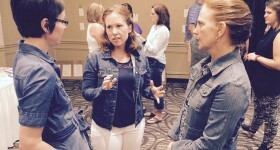 On August 29, 2016, educators from across the Renfrew County Catholic District School Board were invited to gather at the Best Western Hotel in Pembroke to continue learning about effective math instruction. Demonstrating their commitment to helping students gain math knowledge and skills, more than 50 educational assistants, early childhood educators, principals, special education and classroom teachers chose to attend the day led by K-12 Curriculum Coordinators, Lynn Denault and Tracy Joyce. Participants experienced and practiced various number routines and strategies focused on number sense in preparation for the 2016–17 school year. The new strategies will be put to use in classrooms to help students further develop their math skills, and prepare them for the future. “Our goal for the session was to give teachers specific ways to develop students’ number sense—to see patterns in and relationships between numbers to make it easier to understand and be fluent with number facts,” stated Denault. “Another of our goals for this day was to continue to develop and build on the consistency of strategies across the RCCDSB from Kindergarten to Grade 8” added Joyce.